The International Dragon fleet's weeklong festival of sailing in Weymouth got off to a great, if slightly delayed, start today with the South Coast Championship, supported by Aberdeen Asset Management. Originally scheduled to be sailed over two days, strong winds on Sunday had forced the Race Committee to keep the boats in harbour. Fortunately today the weather gods were smiling and the 37 strong fleet enjoyed three tightly fought races in shifty westerly winds of 15-20 knots. Overall Klaus Diederichs, crewed by Andy Beadsworth and Jamie Lea, was top performer of the regatta with a neat 1, 3, 2 score line which gave them a 9 point overall lead and the South Coast Championship Trophy. 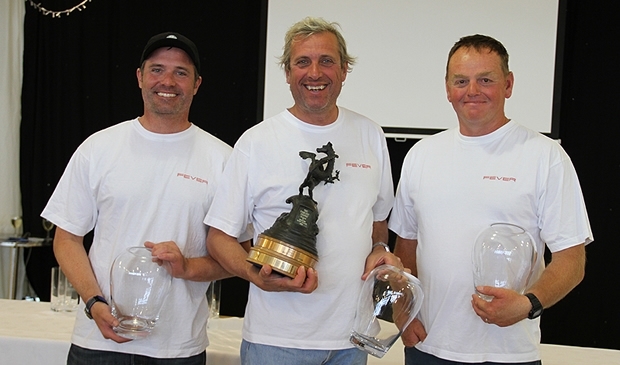 Taking second place overall and claiming the Corinthian Trophy for amateur teams was Julia Bailey, crewed by Graham Bailey, Will Heritage and Keith Tippell, and the podium was completed by Rob Campbell, sailing with Justin and Tom Waples, who also took second place in the Corinthian division. The opening race was to be a good indicator of things to come as Klaus Diederichs put their mark on the fleet leading Julia Bailey across the line with Gavia Wilkinson-Cox, crewed by Jean Sebastien Ponce and Vicente Pinheiro De Melo third and the Australian team of Marcus Blackmore, Terry Wetton and Don Cowie fourth. Race two initially looked to be more of the same until the race committee responded to a right shift on the first run by moving the second weather mark correspondingly right. Unfortunately, just as the boats came round the leeward gate and the time window for further mark changes closed, the sea breeze kicked taking the wind hard left and leaving the second beat completely one sided. A number of boats lost out massively with some even having to crack off for the mark. Whilst others struggled to regain ground, Germany's Marcus Brennecke, crewed by Marc Pickel and Thomas Auracher, went on to win the race in style from Rob Campbell with Klaus Diederichs third, Julia Bailey fourth and David Atkinson, crewed by Ian Turnbull and John Outhwaite fifth. With the sea breeze now firmly established the race committee set up for the third and final race which was to be a four beat marathon testing the sailors stamina as much as their sailing skills. After a somewhat lackluster performance in the opening two races of the event where he had finished 25 and 28, reigning European Champion Jose Matoso and his team of Gustavo Lima and Frederico Melo, finally found some form and led the fleet from the first mark to the finish. Behind him the battle for the remaining top five places was fierce with Klaus Diederichs eventually claiming second from Poul Richard Hoj-Jensen, crewed by Hamish McKay and Andrew Norden, with Gavia Wilkinson-Cox fourth and Grant Gordon, sailing with Ruaridh Scott and Joost Houweling, fifth. At the prize giving there were a number of fun awards presented alongside the main trophies including awards for the top performance by a helm under 30 which went to Jono Brown, for the furthest travelled crew which was presented by Petticrows and won by Bocci Aoyama and his team from Japan, plus some special draw prizes present by event sponsor Zhik whose happy recipients went home with new shoes, sailing smocks and salopettes. With the South Coast Championship completed the fleet now moves into the Edinburgh Cup, for the open British Championship, which will feature up to six races over the next four days. Weymouth will also play host to the 2013 Gazprom International Dragon World Championship from 5-13 September, and so the fleet will grow to 39 teams for the Edinburgh Cup as extra boats take advantage of this opportunity to not only challenge for the prestigious Edinburgh Cup, but also to train on the World Championship race area. Among those joining the fleet for the Edinburgh Cup are defending champion Simon Brien from Northern Ireland and reigning Dragon World Champion Lawrie Smith.